Meadows Chamber Music Honors Concert: The chamber music program presents a dynamic, varied, passionate performance of jury-selected wind, brass, piano and string ensembles. Come hear these students showcasing the results of a semester of intense, peer-driven collaborative work. The event is on Saturday, Dec. 5 at 7:30 p.m in Caruth Auditorium and is free and open to the public. Is Forensic Science an Oxymoron? : Forensic science evidence (e.g., fingerprints, DNA, microscopic hair, & bite marks) is widely believed to provide powerful proof of identity in both criminal and civil trials. But in recent years, forensic scientists in some areas have been taken to task for overclaiming, failing to test their assumptions, and neglecting to explain to judges and jurors how the risk of error affects the value of reported matches. Solutions will be explored by professor Jonathan Koehler, professor at Northwestern University School of Law, on Monday, Dec. 7 at 12:15 p.m. This event will be in 153 Heroy Halland is free and open to the public. Lunch will be provided. R.S.V.P. at lawandstatistics.eventbrite.com or 214-768-3527. The Science of Listening to Music: On Monday, Dec. 7, Professor Elizabeth Margulis, director of the Music Cognition Lab at the University of Arkansas, will examine the interface between science and music by using a series of the Lab’s recent experiments. The event will begin at 4:30 p.m. in 2020 Owen Arts Center. For more information, click here. Christmas and Crêpes: Come join the SMU Wesley Foundation at 3220 Daniel Avenue for crêpes, coffee, community, and Christmas music on Monday, Dec. 7 from 8 – 9:30 p.m.
Student Film Association Fall Film Festival: The Student Filmmakers’ Association will host their annual fall film festival showcasing the best recent short works created by SMU students. The festival is free and open to the public and will take place on Tuesday, Dec. 8 at 7 p.m. at the Angelika Film Center in Mockingbird Station. 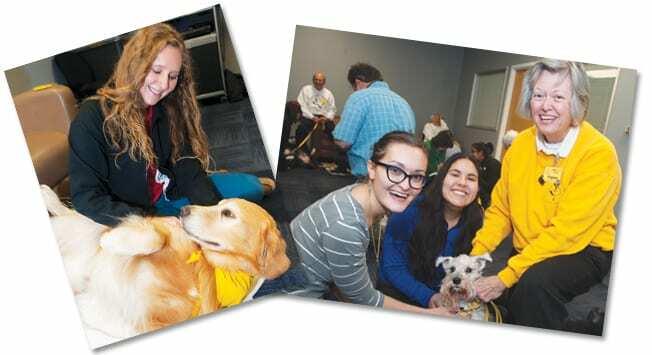 Paws and Take a Break: A team of registered therapy dogs from the A New Leash on Life group will visit the Taubman Atrium on Wednesday, Dec. 9, hosted by Hamon Arts Library. Research has shown that spending 5-24 minutes with a calm dog reduces blood pressure and the levels of stress hormones in the body. Come visit with a certified therapy dog from 11 a.m. – 3 p.m.! Actress and Oak Cliff native Linda Darnell was named one of the most beautiful women in Hollywood by Look magazine. SMU’s Hamon Arts Library hosts a retrospective of her life and career through May 17, 2013. Two recent gifts will expand the special collections housed in SMU’s Jake and Nancy Hamon Arts Library. A gift of personal materials from the estate of Dallas philanthropist and arts patron Nancy Hamon includes $1 million to endow, preserve and exhibit the collection. In addition, a planned estate gift of movie archives valued at $1.5 million has been made by film historian and collector Jeff Gordon. Members of the public and the SMU community will receive a preview of the Gordon collection through “Linda Darnell from Dallas to Hollywood: Selections from the Jeff Gordon Collection.” The exhibition will be on view through May 17, 2013 in the Hawn Gallery, Hamon Arts Library. A preview reception at 6 p.m. Friday, Feb. 8, will be followed by a lecture by Jeff Gordon at 7 p.m. in the Hamon Arts Library. RSVP online at smu.edu/friends or by calling 214-768-3225. Although the entire collection will not be transferred to SMU until a future date, Gordon is curating the Linda Darnell exhibition as a sneak preview of his collection. The show will include posters, photographs and materials from recently acquired scrapbooks of Darnell, a Dallas native who grew up in Oak Cliff and became a major movie star in the 1940s. She starred in cinema classics such as My Darling Clementine, The Mark of Zorro and A Letter to Three Wives with leading men including Tyrone Power, Henry Fonda, Kirk Douglas and Robert Mitchum. Her career peaked with Forever Amber in 1947. She later appeared on television and stage before her tragic death in a house fire in 1965. Nancy Hamon, who died in 2011, provided $5 million in 1988 to establish the Hamon Arts Library at SMU, which opened in 1990. A branch of SMU’s Central University Libraries, it houses materials relevant to the visual, performing and communication arts in support of Meadows School of the Arts. Its archives include the G. William Jones Film and Video Collection, which will house the Gordon Collection, and the Jerry Bywaters Special Collections, where the Hamon materials are located. The Gordon collection bequeathed to SMU includes hundreds of original movie posters, over 1,000 other film-related advertising materials, more than 15,000 35-millimeter slides of movie memorabilia (some of which have already been delivered to SMU), several thousand original movie photos, a 16-millimeter film collection with more than 200 features, more than 20 Warner Bros. cartoons, 100 television programs and a large group of Elvis Presley materials. The Gordon archives focus primarily on movies made from the 1930s to the 1970s. The Hamon materials include photograph albums, diaries, records of Nancy Hamon’s elaborate theme parties in the 1950s and ’60s, memorabilia, personal correspondence with seven U.S. presidents and other prominent leaders, and materials related to her husband’s long career in the oil business. Among highlights of the collection are photos of the Hamons’ trip to China with George H.W. and Barbara Bush in the 1970s. In 2013, as part of its Second Century Celebration, SMU will commemorate The Year of the Library — the 100th anniversary of the University’s library collections, which began to be acquired in 1913. In addition to marking historic milestones, the commemoration will recognize new commitments to update and expand the campus libraries. New gifts such as the Gordon and Hamon collections count toward Second Century Campaign goals, which include new investments for library facilities, endowments for acquisitions and library staff positions, and expansion of special collections. A secret history: Renowned historian and author Zvi Ben-Dor Benite will present the 11th Nate and Ann Levine Endowed Lecture in Jewish Studies at 7:30 p.m. Thursday, Nov. 17, in McCord Auditorium, 306 Dallas Hall. Benite, professor of history and Middle Eastern and Islamic studies and acting director of the Kevorkian Center for Near Eastern Studies at New York University, will discuss “The Truly Other Jewish World History: The Ten Lost Tribes Between Jews and Christians.” His subject is a little-known but intriguing episode of early 16th-century Jewish and Christian history, in which Pope Clement VII and the Ten Tribes (almost) defeated Islam and won the Holy Land. Benite’s 2009 book, The Ten Lost Tribes: A World History, traces the legends surrounding the ancient Israelite tribes that were exiled by the Assyrians in the 8th century BCE and vanished from the pages of history, but not from popular imagination. For more information, contact Serge Frolov, 214-768-4478. Art for sale: Update that holiday gift list – SMU’s Hamon Arts Library holds its 2011 Book Sale at 9 a.m.-8 p.m. Thursday and 9 a.m.-5 p.m. Friday Nov. 17-18 in the Hamon Arts Library, Owen Arts Center. Items for sale include music scores; CDs; DVDs and laserdiscs; and, of course, books on art, music, theater, dance and film, as well as fiction titles. Most items are priced between $1 and $10, and all have no sales tax – plus, the Library will take an additional 50% off all items after 3 p.m. Friday. All sales are final, cash or check only. No holds, bulk discounts or previews. For more information, contact the Hamon circulation desk at 214-768-3813. Save the date: Make plans to attend the 2011 Staff Appreciation Day and President’s Picnic. The annual celebration takes place 11:30 a.m.-1:30 p.m. Wednesday, May 25, on the south lawn of Clements Hall. Stay up-to-date on picnic plans at the Staff Association website.